Rhys took Reserve in a nice champion class this weekend and also earned 30 points towards his UWP CH!! I cut Cajun's nails. And she just remained lying in her bed. She didn't flail or even pull her feet away. I can't even wrap my head around how that just happened. She's not even sedated!! Heck, even when she IS sedated she still tries to fight it! I put Summer in the bath tub because she pooped on herself a bit. I filled the tub then told her to stay while I got the shears. I walked back into the bathroom. Mia looked at me then promptly slinked to the tub and got in a full tub on her own! I laughed so hard. Obviously she thought she was getting a bath too so just decided to get it over with. She HATES baths. I just got Roxie to balance all four feet on top of an exercise ball. I have an awesome dog. I can never believe how trusting she is and the way she just does anything I ask of her... I really wish I was a more worthy owner. She is too good for me. Tonight I see her chewing on something so I approach her and signal for a drop (she's learned signals beautifully since going deaf). She gets up and runs behind the chair instead, like its her most prized position. I catch her and reach into her mouth and retrieve.... A QUARTER. Really Maddie? Really? :rofl1: this dog is going to give me all gray hair! I got her license renewal in the mail for next year. Says 13 years. Does. Not. Like. 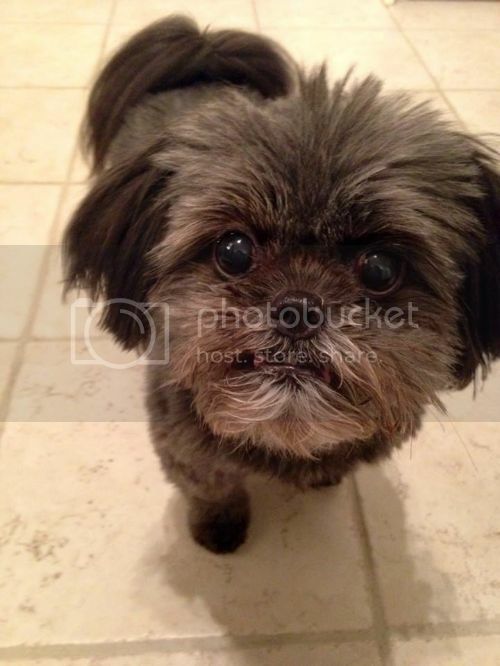 My sister's little ewok mutt is suddenly having seizures, and all her bloodwork came back normal Her real age is unknown, but she's likely somewhere between 8-10 years old. I might go to the vet with them tonight, we are all worried it is a brain tumour. Are brain tumors a common cause of seizures? Locke, a lot of dogs just have idiopathic seizures (no known cause). They manage quite well on seizure medication. So don't expect the worst just yet! The fact that her bloodwork was normal is a good thing, as that means all of her organs are functioning as they should be. I wouldn't see a seizure and go "OMG brain tumor!," but they can cause them. Locke, it could be from a number of things. I would just follow the advice of your vet. And as mentioned, anti-seizure Meds can often manage them. Thanks guys. That's really good to know. I guess I jumped to brain tumour because I've known of about 4-5 dogs that have had seizures out of the blue, and all of them ended up having a brain tumour/cancer. Yes, clear blood work is good, but it also doesn't tell us why...which is hard. It also rules out possible poisoning, diabetes, liver/kidney disease, and infections which can cause seizures. She has had 5 seizures in 48 hours varying from 30 seconds to 1.5 minutes. Most have occurred at night. She started seizure meds yesterday, but I assume they will take a little bit to kick in. Breeder may be pairing Story with one of my favorite working ACD studs. Fudge. 4 dogs are totally do-able. But bird dog for hubs would make it 5. That's crazy. But that's his dog so it doesn't count. But.... but.... you guys are supposed to tell me no. When it comes to a new puppy? NEVER!!! This puppy would be awesome, too. Good confo, high drive, and herding for days. Seriously what you think of when you hear ACD. Hank and Mia just had the BEST play session. And Mia initiated it. Hank stayed very gentle and appropriate with her. And no shrieking this time. The difference between 4 and 5 is really nonexistent. From someone who has had both.